A man wanted in the shooting death of rapper and philanthropist Nipsey Hussle outside his clothing store in Los Angeles' Hyde Park area has been arrested, police said Tuesday. Eric Holder was arrested in the shooting of the 33-year-old rapper, whose legal name is Ermias Asghedom, the Los Angeles Police Department said. Holder is now being held on a $7 million bail. A 911 caller's report of a person believed to be Holder in Bellflower led to the arrest, the LAPD said in a news release. 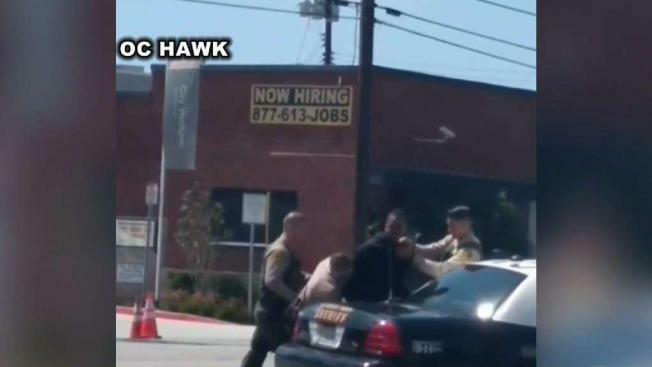 He was taken to a LAPD lockup where he was expected to be booked for murder, officials said. The shooting Sunday also wounded two other people outside Marathon clothing store that Hussle owned. The store was part of a revitalization effort in the community about 10 miles southwest of downtown Los Angeles. On Tuesday, LAPD Chief Michel Moore said the victim and suspect were in some type of argument before the man left the area and returned with a handgun. "We believe this to be a dispute between Mr. Hussle and Mr. Holder," Moore said. "It appears to be a personal matter between the two of them. I'll leave it at that." Details about the dispute were not immediately available. The coroner's office said Hussle died from gunshot wounds to the head and upper body. The shooting took place on Sunday afternoon at around 3:20 p.m. in the 3400 block of West Slauson Avenue, police said. The suspect ran to a nearby alley where a getaway vehicle was waiting, police said. A vigil outside Marathon Monday turned into chaos after a fight broke out, apparently between a person armed with a handgun and another individual in the crowd. In the confusion, hundreds of people stampeded from the area, trampling candles and other items left in tribute to Hussle. At least one person was stabbed and multiple others were injured, authorities said. Volunteers and residents restored memorial items early Tuesday.